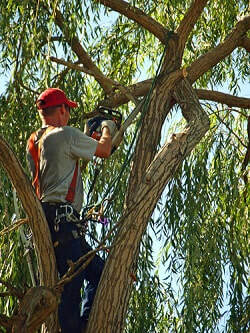 The term "tree pruning" encompasses all sorts of tree trimming, tree cutting, pollarding, crown reduction, etc. Before starting tree work on mature trees, it’s advisable to check whether a tree preservation order is in place. That doesn’t mean that ancient oaks can’t be pruned, but permission is necessary from the council if you want to prune trees with a TPO. Procedures like oak tree crown reduction may be necessary to maintain the health of your trees but it’s easy to cause damage when such tree maintenance is carried out by amateurs, so it should always be undertaken by a qualified tree surgeon. Solihull Arborists will explain what pruning might be necessary and discuss the best course of action and we’ll ensure you understand the cost of tree surgery before we begin. When a tree becomes too dense, air and light may not penetrate and tree can suffer. Crown thinning involves removing some branches but won’t change the shape of your tree. When the entire crown of a tree needs to be made smaller, we prune the branches to shorten them, which is known as crown reduction. Very old trees may benefit from such pruning. When a tree has become a nuisance because it’s just too low, some of the lower branches can be removed to give more headroom for vehicles, buildings or pedestrians. This is known as crown lifting. Regular tree inspections ensure that the right kind of pruning is undertaken to keep your trees healthy and happy. Preventative measures are better than losing precious trees because broken branches allow diseases to enter the plant or because strong winds cause unnecessary damage due to overgrowth. We're always happy to give advice about appropriate tree pruning.